The Old Kings Head pub is situated at the edge of the City and draws a variety of people. Traditional pub fare is served at The Old Kings Head together with a choice of beers, wines and spirits. If requested private parties of up to 80 guests can be catered for. Do you work at The Old Kings Head? What did you think of The Old Kings Head? I like the fact that The Old Kings Head is a locals' pub nestled in amongst all the trendy type places. It's good to see that you can still find somewhere to have a quiet pint and watch some sport. 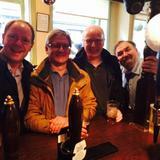 I'd say that The Old Kings Head brings in the punters with its cheap drinks and friendly bar staff. a little dubious – by any chance are you part of the new management? I popped in here last Saturday and all the previous comments stand true! They serve a great Guinness in here, atmosphere was friendly and warm did not have food. A gem of a pub. Amazing pub! Read a review on here and thought I have to try it. It's not red anymore so initially I thought it was the wrong pub but no it's just been decorated. 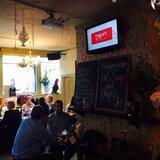 It's lovely inside, lovely staff, lovely food and you can watch the football! I come here often with my boyfriend as he likes to watch the football but I just enjoy the atmosphere and the wine and can't resist their Ham, Egg and Chips - an all time classic! The girls behind the bar are so lovely and welcoming unlike some of the other bars in the area, this is a proper pub would highly recommend it! So glad i fell across this little pub. Tucked away a bit but still close to hoxton and the city. Beer is one of the cheapest in the area and food is not bad as well. The Halloween party they threw last week was amazing, they really went for it decorations and games were great, all bar staff really went for it in there fancy dress. Hope this is a yearly event will be returning next year. Worth a look. This IS a friendly pub, you know! A happy discovery I that I stumbled upon- popped in for a half of Guinness, and stayed for another! The music isn't too loud either, thankfully. Why hasn't anyone mentioned the lovely decor, though? Comfy couches and candlelight compliment the soothing red colour scheme- you're basically getting a style bar without the rip-off prices and attitude! Oh, yeah- it's nice that it's tucked out of the way of the main streets, too. A hidden gem. No, the bar staff at night are hottest... my pint of Guiness was blinding and if your a regular one of the hot girls goes to the bagel shop and gets bagels for everyone!!!! Its the best place ever! Just been taken over by new managment i belive and what a difference. Fab food both by day and night. Lunch food cheap and tasty. Big screen for the sports and on a firday night what more you could ask for than, free bar food and £2 a pint till 7pm..
Low prices and high spirits are the order of the day at this friendly, quirky City establishment. The Old Kings Head juts out from the corner of Scrutton Road and Holywell Road, approaching Shoreditch and Old Street station but still in the shadow of the City’s skyscrapers. A distinctive green-tile exterior and bistrot-like outside seating area draw you in to the bar’s main room, an oddly-shaped and vaguely triangular space which allows for several cosy nooks and crannies, on any number of benches, chairs and a comfortable cream-coloured sofa. Despite the unusual lay-out, overcrowding isn’t usually a problem, and a large mirror on the far wall provides the illusion of depth. Customers usually congregate around the central wood-panelled bar, decked out with stools and blackboards, while copious windows provide plenty of natural illumination, supplemented by candlelight at sunset. Somewhat of a hidden treasure, the Old Kings Head has justifiably received plaudits from local patrons for its friendly and welcoming atmosphere, exemplified by the lovely staff and customers. The latter usually originate from nearby offices and places of work, and echo the diversity and openness of nearby Brick Lane and Shoreditch, even if the average age is a little higher than elsewhere. Non-intrusive televised live sport, comfortable seating and upbeat music serve to consolidate the pub’s reputation as a fantastic, reclusive post-work hang-out. 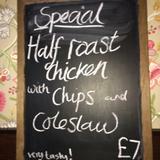 Nourishing, tasty and relatively cheap, the menu at the Old Kings Head is a big hit with regulars. A failsafe list of “lunch specials” (£5 for lasagna, burgers and Ploughmans among others) is complemented during the evening shift by the ever-changing dish of the day, usually very affordable and extremely good value for money – steak and chips for £8 being a prime example. Add to that a selection of salads and sandwiches for as little as £2, and it’s safe to say that simple, satisfying food is a major ace up this venue’s sleeve. 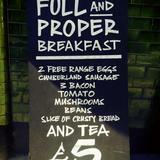 As with the food menu, drinks at the Old Kings Head prove to be impervious to the “City prices” phenomenon. A double shot of house spirits comes to £2.50, and the wine list is similarly eye-catching in its quality-to-price ratio, with a decent glass of house white starting at £3.20, and bottles of prosecco available for £18.50. Aspalls, Fosters and Amstel (£3.20-£3.60 a pint) are among the draught and bottled lagers and ciders on offer. 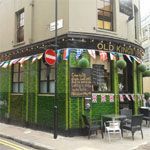 With a friendly atmosphere and low prices to match its off-beat location and design, the Old Kings Head is a local pub that oozes panache, and is certainly worth a visit from further afield as well.